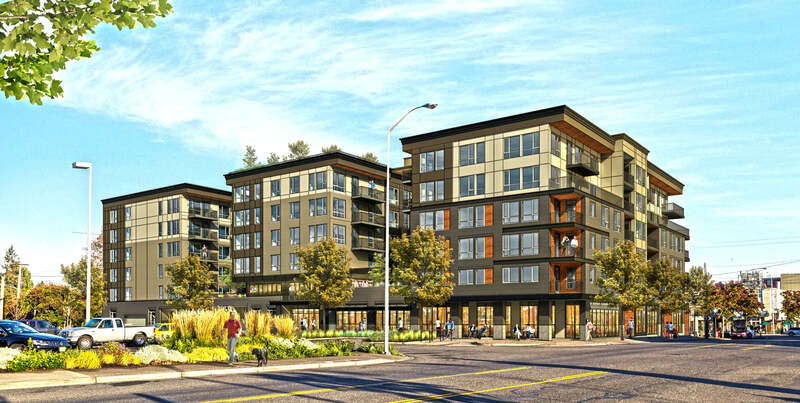 A rendering of Madison25, a new multifamily development coming to Tacoma's Proctor district. A chain-link fence closed off a block in Tacoma’s Proctor District on Monday — along with dresses, suits and other forgotten clothing at a former dry cleaners. It’s the site of Madison 25, the soon-to-be sister development of Proctor Station. The block is bordered by North Proctor, North Madison and North 25th Streets and an alley. Demolition will start in February or March and construction will immediately follow, said Deanna Dargan of Rush Development Co. of Gig Harbor. Strong winds Wednesday were blowing the green cloth-covered fence outside the former Proctor Dry Cleaners. Inside, dozens of garments still hung on a conveyor. The clothes were still in the business when the development company bought the building, Dargan said. They will be donated to charity. Soil was tested around the cleaners, and no contamination was found, she said. Along with the cleaners, the block contains about four houses and one other business, most recently Sonja, a women’s clothing store. Habitat for Humanity will remove salvageable items from the homes, Dargan said. Like Proctor Station, Madison 25 will have about 140 apartments, will be six stories tall with internal parking for residents and include a ground-floor retail component. Proctor Station is 100 percent leased, Dargan said. Both developments have their detractors. Critics say the buildings are too tall for the area, affect parking and ruin the character of the neighborhood.